Everyone has their own favourite way to cut a mango. 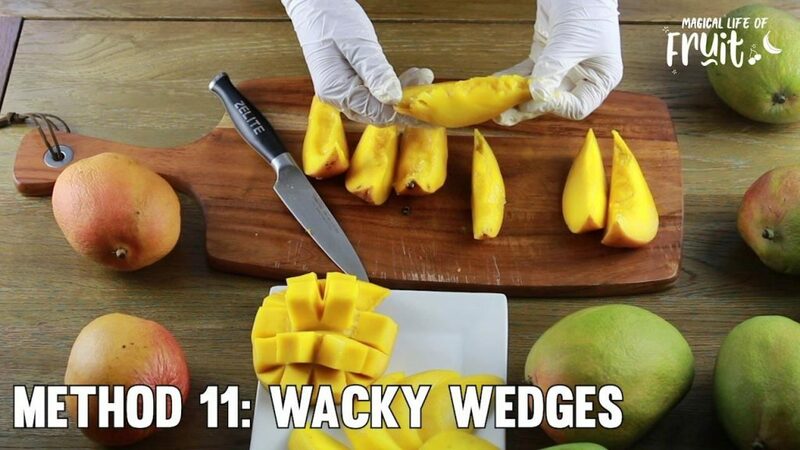 You wouldn’t believe how many different ways there are to cut a mango, but I wanted to show you 12 of the best ways to cut a mango in this video so you can choose your favourite way. I actually ended up including 3 extra bonus methods for you too! Which is your favourite way to cut a mango? The first way we’re going to peel a mango is using a peeler. The benefit of using a peeler to peel a mango is that there is zero wastage unlike when you use a knife where you end up taking off too much of the flesh, and therefore wasting the mango. Get your mango and dig your peeler in. Make sure it actually gets underneath the skin. Get all of the skin off, peeling right to the very tip of the stem. Now your mango is free to do what you want to. You can just eat it like that, or you can slice it. And next, I’m going to show you how to slice the mango. Now that you’ve removed the skin, there are several different ways in which you can slice it. And I’ll just show you two different ways. Simply slice off what’s called a cheek of the mango. And then move your knife about half an inch over to one of the sides, and then start to slice. If you hit something, if you feel a resistance, you’ve hit the pit in the middle, so just move your knife over very slightly away from it, and you’ll be able to continue cutting. I’ve sliced off one of the cheeks here, so once you’ve done that you can slice it in whatever way you want. 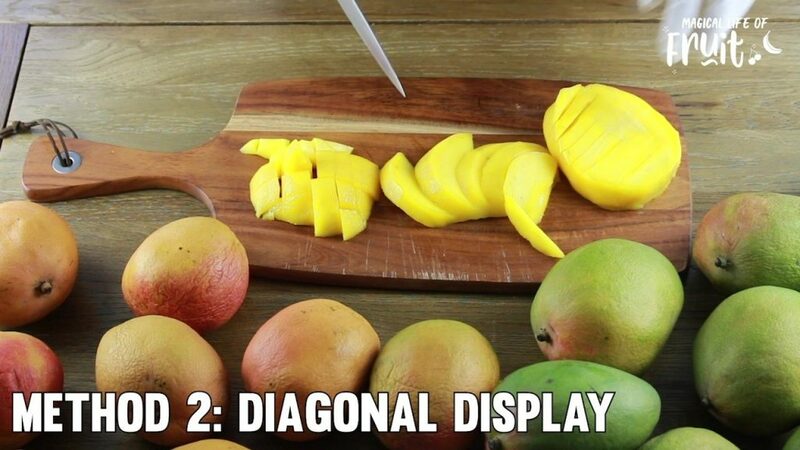 You can simply cut beautiful mango slices length-ways. 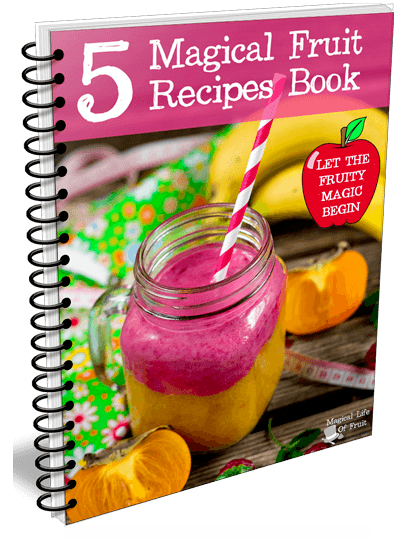 Or you can dice it, or you can just throw it straight in the blender if you are making a smoothie. So that’s one method of slicing a mango. This is another handy way of cutting a mango without having to slice off a whole cheek first and then cutting it. Cut down the cheek using diagonal cuts. Then slice off the cheek, and at the same time you’ve got diagonal slices. Arrange the mango slices on a plate, so it looks really fancy. It looks much more appealing for people to take a little slice of mango like that. Then finally, what we’ve got left is the pit but with a lot of flesh on the sides of it. So chop that off too so that you don’t waste any of the delicious mango. You can chop down and if you hit the pit just move your knife over to the side a little bit continue cutting the outside of the pit. As you can see I’ve got lots of flesh there that we can use. Turn the remaining mango pit and try to cut off as much of the flesh as possible so that you won’t waste it. 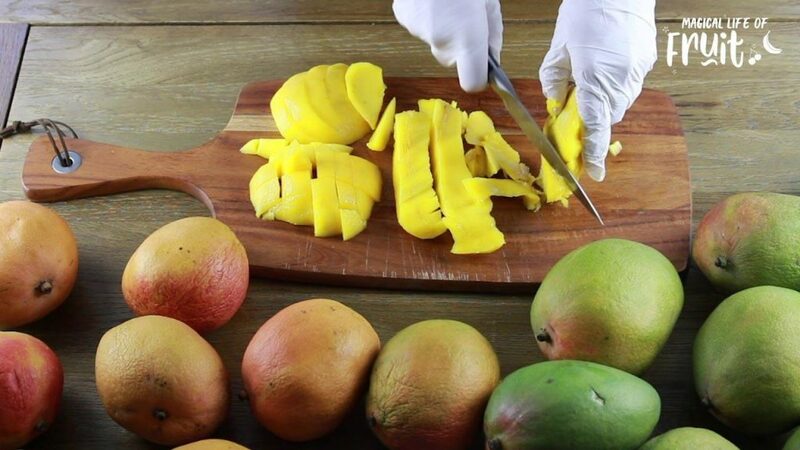 But make sure to be very careful and make sure that your fingers are well out of the way of the knife when you’re doing this last bit because this can be the most unstable and slippy part of cutting a mango. This takes a bit of practice to perfect. This is the pit, the seed inside a mango. You can either throw it away, or you can actually plant that, and I’ll show you in a different video how to do that. Here is another cool technique that you can use for cutting mangoes. First cut the cheeks off from both sides. Then make a little hedgehog, by slicing checkerboards in each cheek. Make cuts lengthwise and then horizontally. Make sure you don’t cut through the skin at the bottom! When this is done, just use your thumbs and fingers to press underneath and push the flesh up. You can serve it just like that or cut off the square pieces of mango into a bowl. To do that all you do is you push your knife along the bottom of the mango and get all pieces of mango off. Another one of the ways to cut a mango making slices with the skin still on. Then take a slice, push it up slightly from the bottom and cut through with your knife, slicing the skin off and leaving the flesh behind. This is another really safe way to eat mangoes. Cut off the cheeks of the mango individually. Then simply take a spoon and dig into the flesh, make little circles with the spoon and scoop out the flesh. Now just enjoy it like that! Do the same again, just keep scooping and eating the mango. You can do the same with the side pieces of the mango as well. Just take your spoon and then slide it into the skin. The flesh comes off really easily! It’s actually easier to use a spoon than it is to use a knife and is also safer because don’t risk hurting yourself. This is another one of the ways to cut a mango which is just a bit different from the previous method. You can use this method if you don’t need to make a pretty display, for instance if you need to make a mango smoothie. Get a spoon and run it right next to the skin under the flesh. And take off all of the flesh this way. Now you can just pop the scooped out mango flesh in your blender for your smoothie etc. You can simply take out all the skin in one go, and that just leaves the skin. 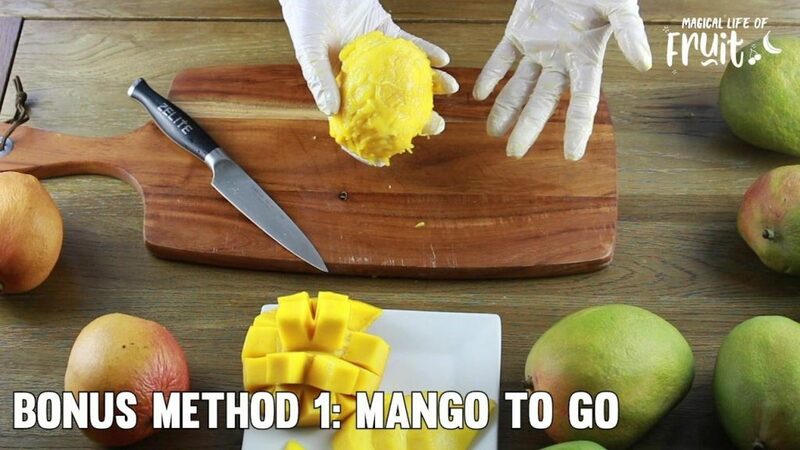 This is a method using a tool that makes eating a mango very, very fast. This would take you seconds, especially once you’ve had some practice and if you’re in a rush and you don’t have much time to waste. Get your mango and slice off the cheeks very quickly. Then get your mango tool (which has these little ridges in it) and simply dig it in to the flesh of the cheek. Drag the tool through the flesh. 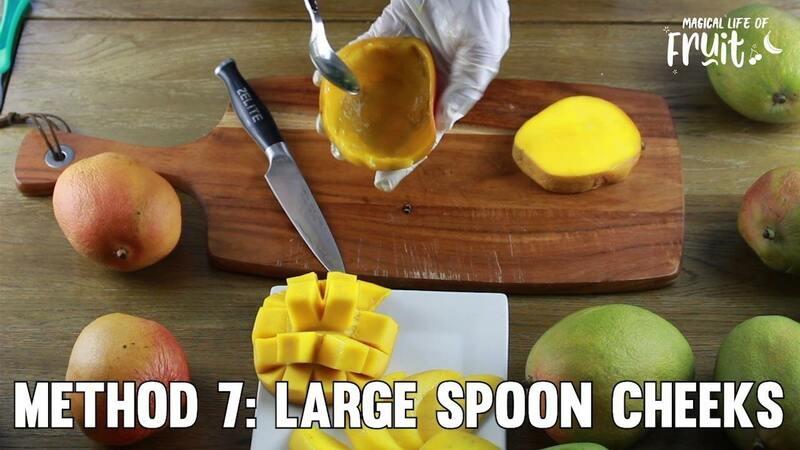 This scoops and slices the mango so you can just place that in a bowl and eat it! It’s a very, very quick way to eat a mango. It took me just seconds! And this tool can also be used for other fruit as well, like avocado and also papaya. I like to eat mango and papaya at the same time in a bowl. I think the combination is just beautiful. 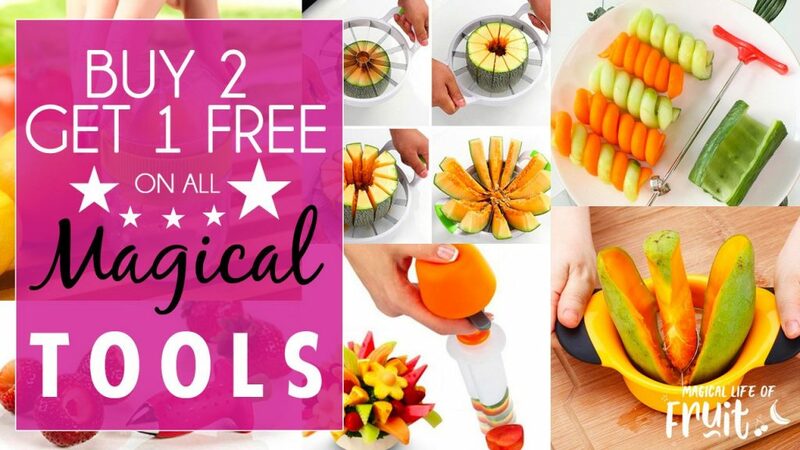 And you can also get this Magical Fruit Scooper & Slicer tool in my shop at the moment and I’ve got a special deal or see the resources below to get it. 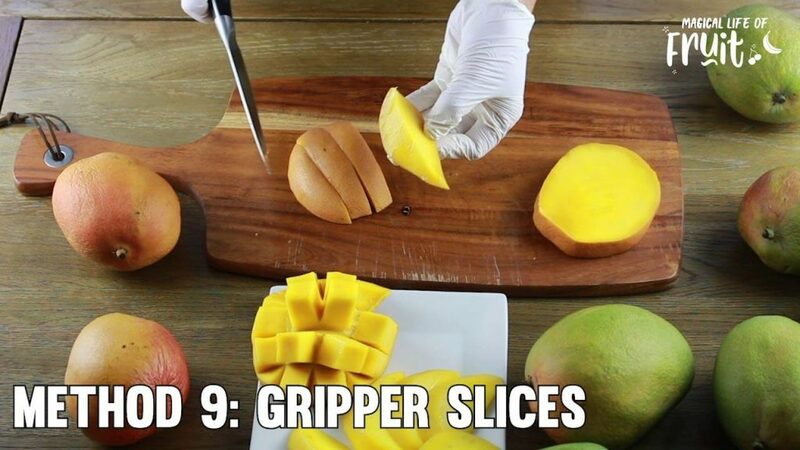 This is another one of the ways to cut a mango, which is very easy. This way is perfect for kids, because you can easily get a grip of the mango slice when you eat because it’s not going to slip out of your fingers. Cut off the cheeks from the mango. Simply slice the cheek with the skin still on. Serve it up on a plate just like that with the skin still on. If you like to eat mangoes slices without the skin on this is a great way for that. Then simply run a knife under the flesh and take off the flesh that way. 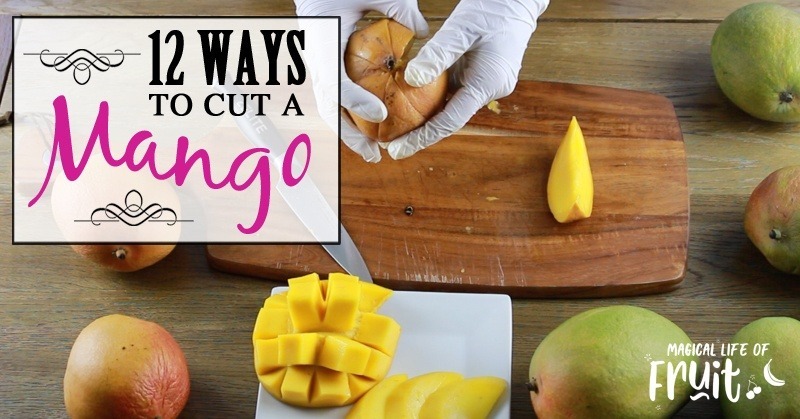 This is another one of the cool ways to cut a mango. This is quite a beautiful way to present a mango. Take your mango and cut down lengthwise from top to bottom with the skin still on. Then move over a little bit, about half an inch, and cut lengthwise again creating a wedge. Do this all the way around, cutting to create big wedges out of your mango until you get back to where you started from. Then simply pull apart the wedges leaving the pit. There you go, now you just take a wedge and enjoy it! If you’ve managed to cut wedges, and you decide that you actually want the flesh off separately, try out this method. Simply push your fingers right underneath the flesh and push the flesh off. It doesn’t matter what size the mango is! You can use this method with mango wedges, or just the entire cheeks or with the hedgehogs too, to get the luscious flesh off without a knife. I often do this instead of using a knife. This way you really connect with your food as well, when you’re touching the food. This does get a little messy though, when you’re using your fingers, but as you can see it’s really fast. Here is another way to eat the mango which you can do either using your fingers or a knife. Say if you’re out and about and you just want to eat a mango but you don’t have any way to chop it? Then you can use your fingers! Just dig your nails in and then simply peel off the skin. Or if you’re at home you want to give mangoes to your kids, this is a good way for that. You can slice crosses on the top of the mango with a knife. And then peel (rip) the skin down halfway, not all the way down. And then you can give it to your kids. This way they can hold it from the bottom and bite it along the top and then when they get a bit further down they can just peel it a bit more as they go. Or just peel off the entire skin if you want to! The skin comes off really, really easily in ripe mangoes. I don’t even need a peeler or a knife! 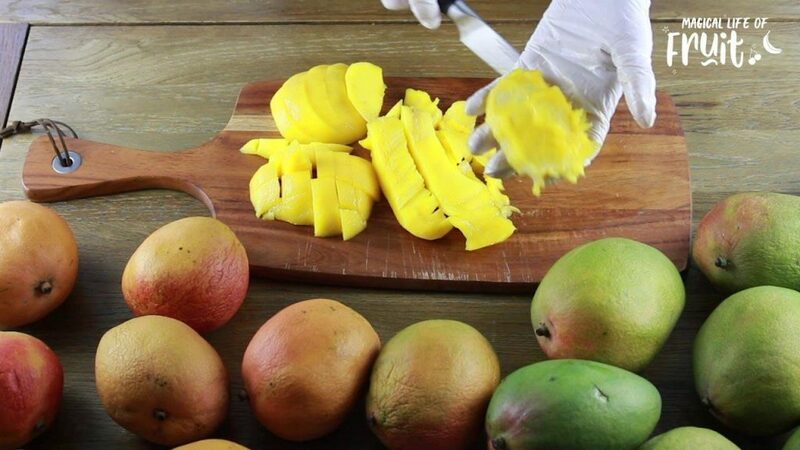 This is a quick way to chop mango once you’ve peeled it. Get your peeled mango and slice checkerboards into it. Then you can just cut it all off in one go (like you would cut off a cheek). 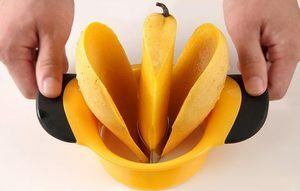 Here is another cool tool that you can use to cut your mangoes. This is a bit like an apple wedger, only this a mango wedger. So, literally with one push you can remove the mango cheeks with this, so you don’t have to use a knife at all. This cuts the both cheeks of the mango in one go and no knife required! And this is another tool that you can get in the Magical Life of Fruit store. And I have a special deal on these at the moment so click here to get this cool Magical Mango Splitter. I hope that you really enjoyed this video and if you did, I want to encourage you to like it, to subscribe to my Magical Life Of Fruit YouTube channel and to share it so that you can spread the magical life of fruit message and all the fruity love to help transform other people’s lives. I would really appreciate that. Thank you so much. 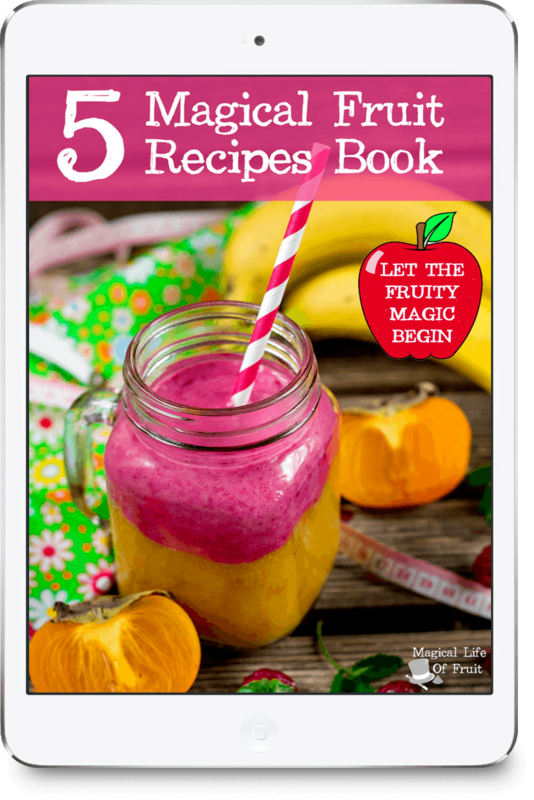 And if you want to get this month’s special deals which we’ve got in the store this month, you can go to shop.magicallifeoffruit.com or check out the resources below to get those special offers. And until next time, I really hope that you go make your own magical life of fruit. Avoid having to guess where the mango pit is and use this fast and easy mango splitter. Mango lovers are bound to love this, slice and remove the pit in a mango in one single press with this handy mango splitter. This fruit scooper and slicer is easy and quick to use. 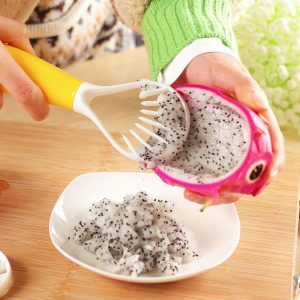 You can use this to scoop/slice mangoes, melons, papaya, kiwis, dragon fruit, watermelon and bell peppers etc. If you enjoyed this article, 12 Ways To Cut A Mango please let me know your thoughts in the comments.